Born on 20-Dec-1870 to David Asbury GARDNER and Julia Ann PAYNE in Dyer County, Tennessee. His grandfather, also David, settled in Gibson County, Tennessee, from Indiana in the 1840's and served in the Confederate Army as a Captain in Co. K of the 12th Missouri Infantry Regiment. William Henry had three brothers, two sisters, and a half-brother (see David Asbury GARDNER Family Group Record). 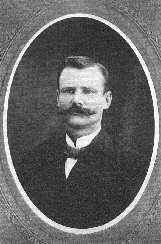 William Henry edited and published the Gibson County Democrat newspaper and worked as a printer at the Dyer County Herald. He also published a music magazine called the Metronome and directed the choir at the Dyersburg Methodist Church. He married his first wife, Lavinia "Vinnie" Ramsey, on 26-Jun-1892 and had a son Will who was born in 1893. A letter from his mother to his brother George, dated March 18, 1896, states "Will and Vinnie have parted again and she has gone back to her father's. Will is in good business in the Herald Office if he would try to do right he could get along very well. I don't know whether Vinnie will try to take the baby or not. She hasn't got it yet. -- You're Mother, J. A. Gardner "
William Henry joined the U.S. Army in August, 1899, and was assigned to the 33rd Regt. U.S.V. Infantry, Co. I ("The Texas Regiment") to fight in the Philippine War (Insurrection 1899-1902) which followed the Spanish-American War. He attained the rank of sergeant before being honorably disharged on 27-Feb-1901. It appears that immediately upon being mustered-out of the Army, he joined the newly-formed civilian police force in Manila. During this time, he corresponded with the Dyersburg State Gazette and Dyer County Herald newspapers describing his work. Also during this period he met Ceferina DE CASTRO whom he married on 1-June-1905 (marriage certificate obtained on 25-Jun-1918). His Letter to Brother Walter written in 1923 described his situation. The family grew to 6 children (apparently 3 others died in infancy) and lived in a house next to the police station. (see William Henry GARDNER Family Group Record). He patroled the area around Sampaloc and his last address was listed as the Meisic Police Station. William Henry died of a heart-attack on 12-Mar-1929, after being admitted to St. Luke's Hospital a month earlier, and was buried at Cementerio del Norte, Fraternal Order of Eagles plot, Manila. He was 57 years old. His wife, Ceferina, was buried at the same plot when she died in 1948. Letter to Brother Walter dated 4-Jan-1923. The Gardner Family Journal by Flora Bass Gardner, 1996. Family records of Patsy Ellis, 1999.